Hello Everyone! 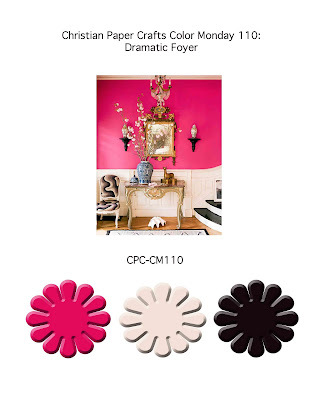 It's Monday and that means it's time for another Color Monday at Christian Paper Crafts. Our color story this week is full of drama! We would love for you to come play along with us. 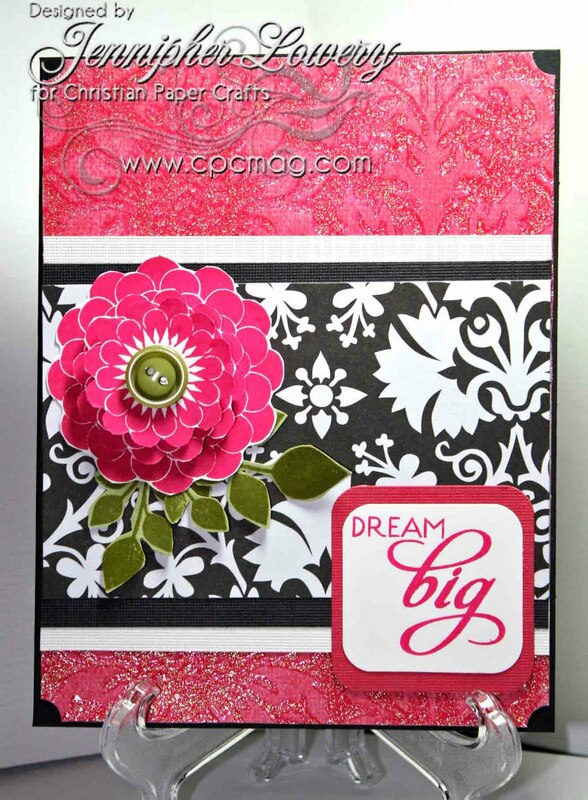 You can create anything you like...card, ATC, scrapbook page, fat book page, altered item, etc. If you are not a member you can play along with the challenge at the CPC Creative Blog. You will find other challenges there as well that you can play along with- one for every day of the week except Sunday. Hope to see you there. Also, this week at the Sisterhood of Crafters the challenge is to use buttons on your project. I used a button for the center of my flower. Wow! This is sensational! Fabulous translation of the inspiration photo! Very pretty card. The flower is terrific and the button really adds to it. What a beautiful, happy creation! Love your choice of colors! Thanks so much for joining our BUTTON challenge at THE SISTERHOOD! Hope to see you again next challenge. This is stunning, love the flower, did you really sit and cut those out :0. 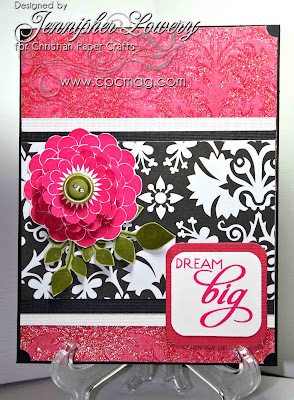 Love everything about this card, from the colors to the DSP and that fab flower. Have a great Monday. I love your blossom Jennipher! The button gives it a vintage feel. Stunning! I love the big flower. Beautiful card. The colors are fabulous! Jennipher, this is simply a beauty!!!! Gorgeous card. Wow that flower is fabulous Jennipher, love the green color added to all of it too! Great card. What a gorgeous card!!! Just the perfect effect for those 'wow' colors. WOw, is this ever stunning! THe pink and black are such a vivid color together - the flower is a real visual show case, too! Gorgeous! You totally rocked this challenge. Beautiful card! Wowza! Gorgeous card, Jennipher! I love everything about it. It's just fabulous! Okay, I literally just said "Oh Wow!" Stunning card! I love the colors and mix of patterns. And that flower - wow. Beautiful work! Very pretty, love the color combo and that flower is fab! wow! your card is so stunning! i love this vivid colour-combination! Beautiful card! Love all of the layers on the flower! Wow this is gorgeous!! The colors and the flower are amazing!! A beautiful card, such gorgeous colours. That's really beautiful, nice mix of color too!!! Wow girl, that is a stunner!! I love it!! !